To be honest, I was surprised when there was a Pizza review. Especially when its from Domino's Pizza. Since I was dying to have some good, cheesy and pepperonious pizza, I joined! After finishing work from Bangi, I flew straight to Setia Alam under the rainy weather and ridiculous traffic, causing me to use the emergency lane all the way. Somewhat thankful that there was no roadblock or flesh eating cops along the way. 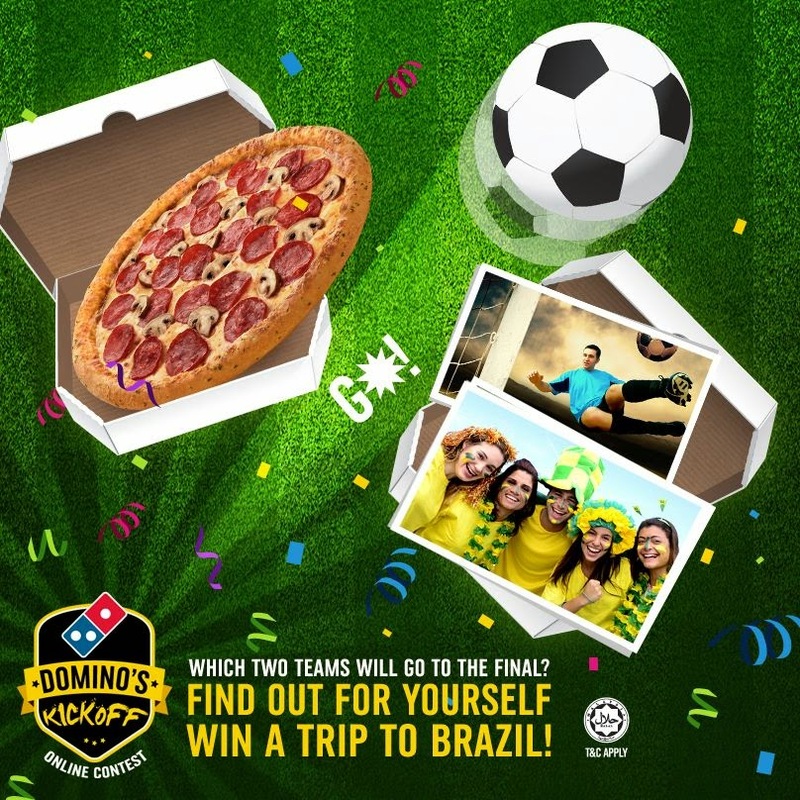 In conjunction with one the world's most popular sport, Domino's Pizza Malaysia has organized a new and exciting online contest. 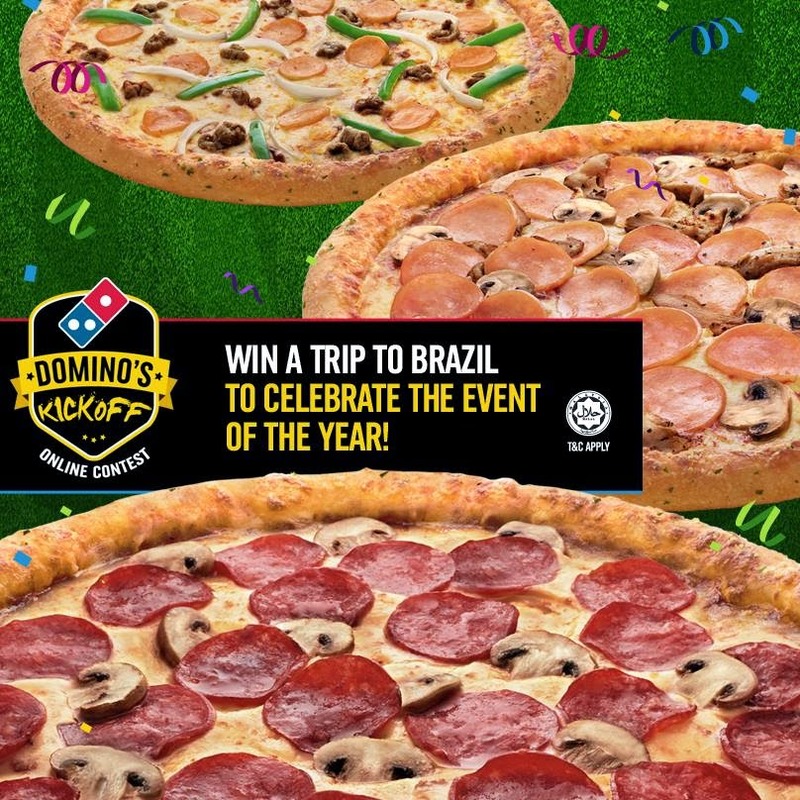 It includes playing a game from Domino's Pizza Malaysia's Facebook page, eating pizzas with your friends and family, get the overall highest score and stand a chance to win an all expense paid trip to Brazil worth RM34,000! This is possibly one of the biggest Domino's Pizza in Malaysia I've ever seen. Ample seating areas! Crispy on the outside, warm and fluffy on the inside. Not to mention the generous amount of garlic spread layered on top. Absolutely delicious. The 3 new main pizzas! Without doubt, this was my first and favourite piece. Its basically an extension and combination of the Pepperoni Pizza and BBQ Chicken Pizza, with additional mushrooms of course. Rich smokey BBQ base, crisp and chewy pepperoni, juicy mushrooms topped with melted cheese on an awesome New York Crust (My favourite crust). For a better understanding of pizzas, watch this clip from How I Met Your Mother, Season 9. Spoiler alert for those who have not completed the series. Similar to the Smoky Pepperoni & Mushroom, only with chicken pepperoni and additional roasted chicken! As you can see, all those amazing, mouth-watering, voluptuous cheese oozing out from in between two crusts. Chicken pepperoni, ground beef and chicken potpourri sausage, onion slices and green pepper, smokey BBQ sauce on a thin, rectangular cut pizza! I will always remember the first thin crust pizza I had was from Domino's, at the age of 6. It was one of the reasons I kept coming back, besides the oven fresh pizzas unobtainable from other franchise. Pizza with a twist of Malaysian delight. Flaming hot sambal with chopped chilis, green pepper, anchovies and shredded chicken! This is the one of the few spicy pizzas that I actually enjoy, besides the Flaming Tuna and Tropical Sambal Prawn. After all, it was pretty spicy for a pizza and the cheese was overflowing! Whats better than a pizza topped with plenty of cheese? More cheese at the crust of the pizza! Combining all 3 mistresses, Cheddar, Mozzarella and Parmesan into a long stretch of never ending cycle around the pizza. Awesome sambal sauce (very spicy) along with generous amount of prawns and chopped chilis! For Aloha Chicken or Pineapples on pizza lovers, this will be of benefit to all of you. Juicy, sweet pineapples topped generously with cheese, roasted chicken and mushrooms, all on a pan crust pizza. Its basically an upgraded version of the Aloha Chicken. Call it Aloha Chicken 2.0 if you must. My all time 3rd favourite pizza from Domino's Pizza. I really do enjoy the sweet and savoury secret white sauce. That reason is more than sufficient for me to order this. Alongside with its new Cheesy Pan Crust, it was pretty damn good. The crust was not doughy or hard to chew but rather crisp and fluffy. Comprising of Onion rings, chicken wings and popcorn chicken (spicy and original), it makes a great side dish. I myself enjoy the wings and actually taking most of it. Cheesy break sticks, fluffy and flavourful to taste. Finally, dessert. Look at that glorious amount of chocolate, flowing right back in the chocolate lava cake. It was filled with hopes and dreams of many children, wishing for that one bite. To me, it wasn't as sweet as I'd expect it to be. But to some, they may not be able to tolerate the chocolaty goodness. There are over 112 Domino's Pizza restaurant in Malaysia. Call 1-300-888-333 to have them deliver your over fresh pizzas, right to your door step! 30 minutes arrival time or a regular pizza on the house!